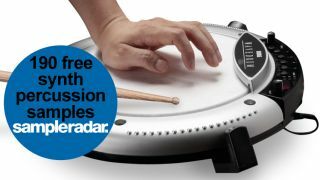 Percussion to most people means congas, shakers and the like, but you can also add rhythmic interest using electronic instruments. This week's SampleRadar illustrates this perfectly: our new collection features sounds from various drum machines and a whole lot of processing loveliness. The synth percussion samples are divided into three folders, two of which contain sounds from the Korg Wavedrum and Vermona DRM1 MkIII and another that contains miscellaneous loops. The pure evil samples are supplied in a zip file, so you'll need to extract them before you can see them. Enjoy!